You are stranded on a desert island. 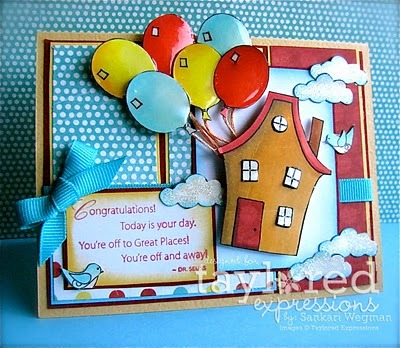 The good news is that you find a fabulous stamping hut well-stocked with papers, inks and other stamping supplies, however you only have the 5 stamp sets you brought with you in the luggage you managed to salvage. 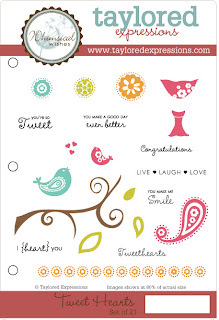 So tell us, what stamps sets did you bring and why? that the DT have created since the Hangin' Out stamp set was released!! 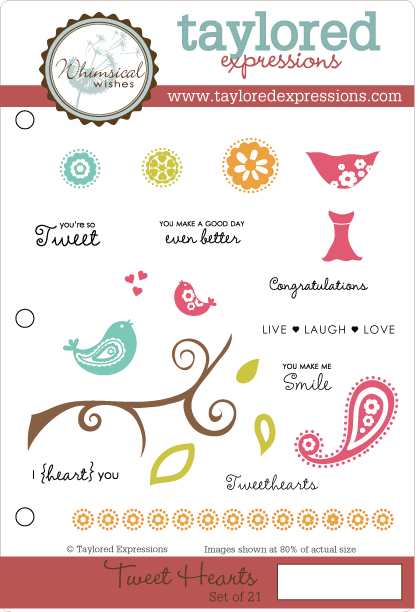 Also you can check out all of the other Hangin' Out sets from Taylored Expressions HERE! You can't be on a desert island without have some desserts right?? LOL! 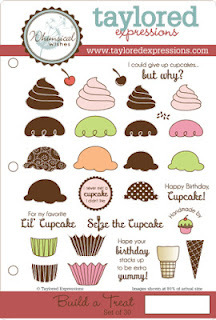 The other favorite stamp set is all about cupcakes and is called Build a Treat Stamp set and like its name, I love that there are countless possibilities in how you build your own cupcake! Here are one of my favorite cards using this set and you can check out all the creations using the Build a Treat stamp set in the TE Gallery right here! 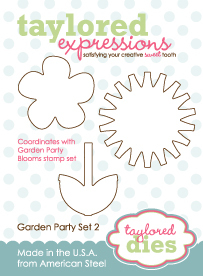 One of my most favorite stamp sets to be releasers was the Branching Out set (which has a Petite coordinate) but works so well with every single stamp set! I love these stamps because of how they look - so much fun whimsy!! 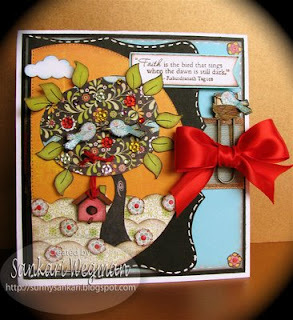 I love that you can create a card with just the branches or paper piece the tree like I did in this card or color it in - or use another different tree! So many options! 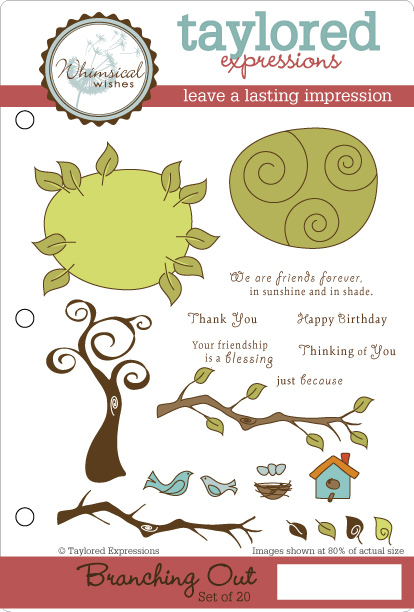 Check out all the creations using the Branches Out stamp set in the TE gallery! 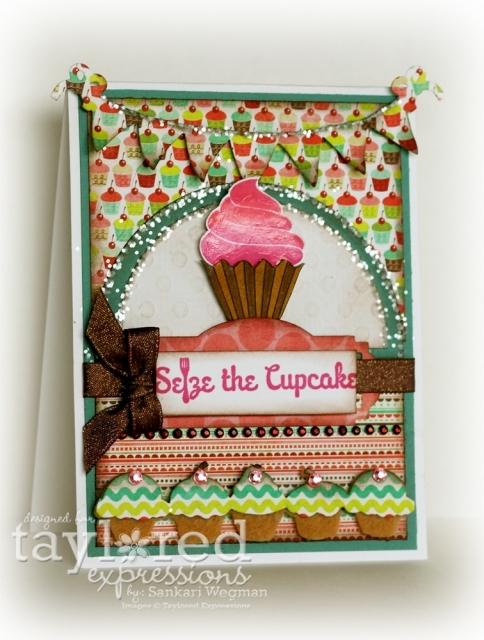 It is so much fun to create cards by mixing and matching the different sentiments and images together and I love how all of Taylor's stamp sets do exactly that!!! 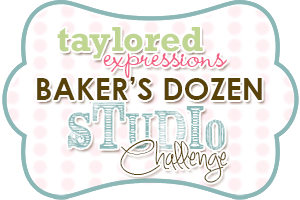 Please check out with me how the rest of the Baker's Dozen DT answered the July Studio challenge and I can't wait to see what their favorite 5 stamp sets are! Is it just me or is the summer flying by so fast! I can't even believe how quickly time is flying by! One of my goals for the summer was just to be with family - once the kids are in school, I feel like I am chauffeuring everyone from school to soccer to gymnastics, etc etc... and so over the summer its been so nice to take a break from everything and just be with the kids and try to have an adventure everyday with them! 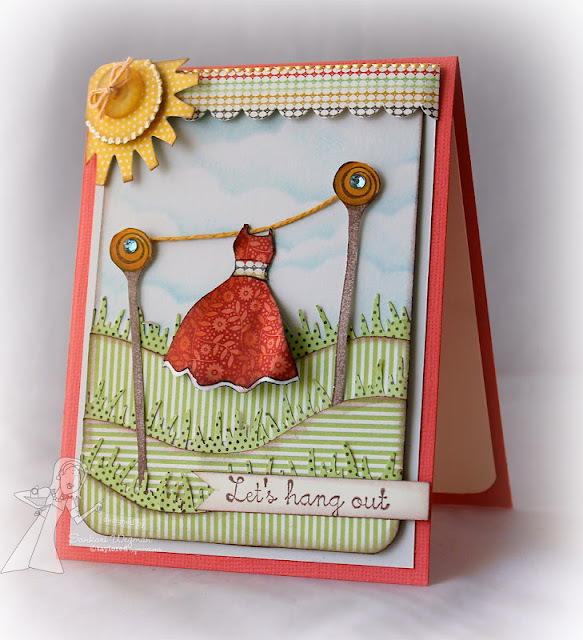 I made this quick card using the Sky's the Limit Petite stamp set from Taylored Expressions which has the cutest little hot air balloon and I love the sentiment: Be Happy - cause that is what life is all about - just the enjoying and being happy with the simple pleasures of life! 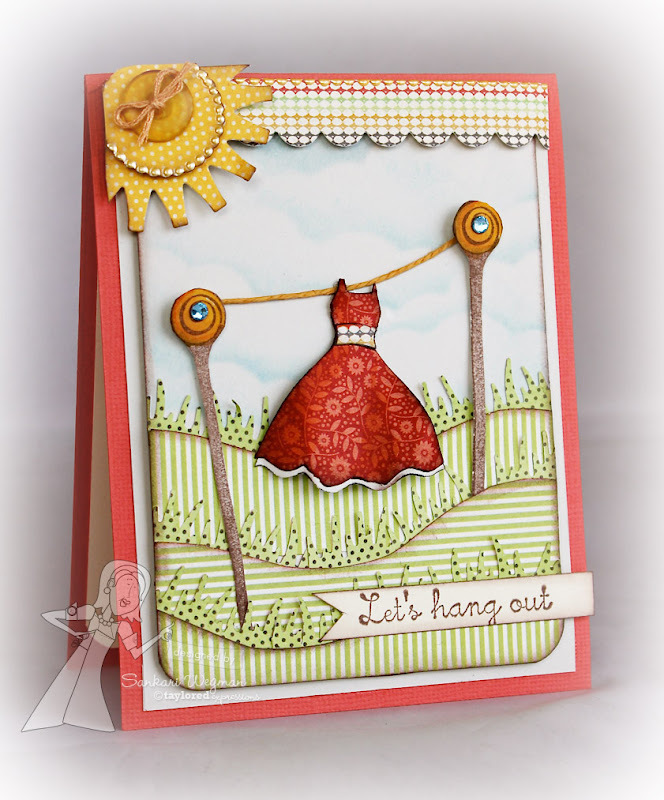 I absolutely loved making this card it was so much fun - and it is a reminder to always be happy - everyday! Wishing you all a happy day! 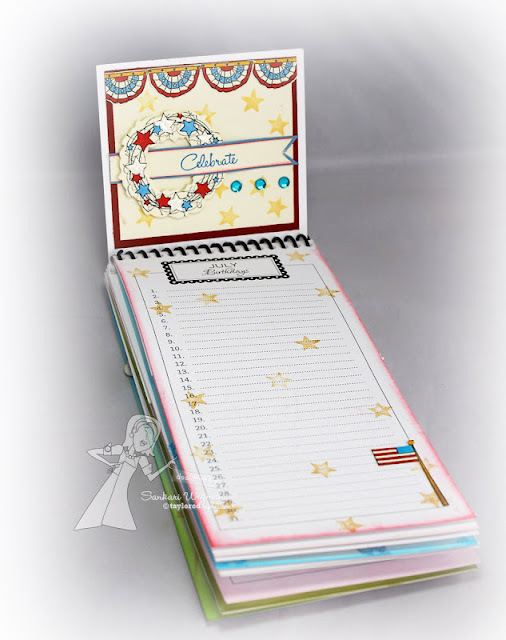 I also used the flag from the Yankee Doodle Homestead stamp set that I cut out and colored and adhered at the bottom of the page. I stamped some gold stars on the page and added a little bit of bling to the wreath. I love how this page turned out and I love making a page for each month - such a great way to keep track of birthdays and anniversaries!!! 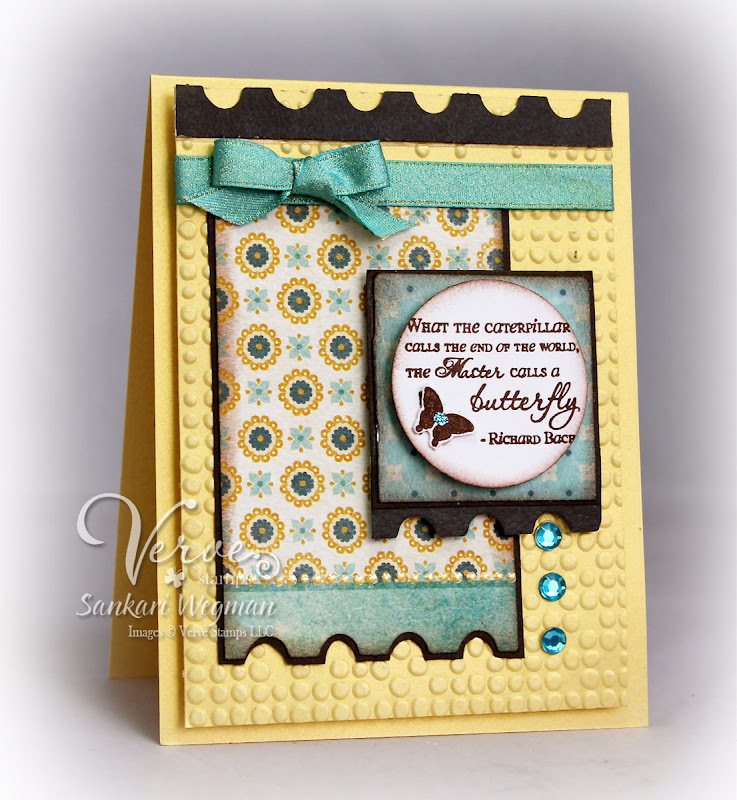 Today is our Monthly Verve Diva Hop where we all create a project using some of our Favorite previously released Verve Stamps!!! If you are coming from the amazingly talented and super sweet Julee - then you are in the right place! 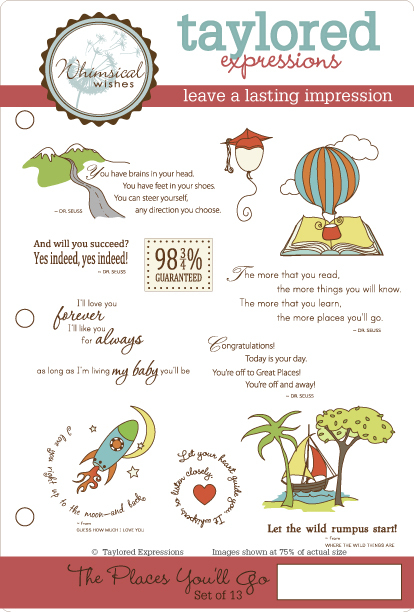 One of my favorite Verve stamp sets is Beautiful You (okay - you are right, they are all my favorite!!) But this set has so many beautiful sentiments, I especially love the sentiment: "What the caterpillar calls the end of the world, the Master calls a butterfly." So beautiful! I wanted to create a simple happy card with this sentiment - so I tried to keep it CAS and used one of Julee's beautiful previous Mojo Monday sketches (MojoMonday Sketch # 244) for my card. I embossed the back and used some scrap pieces of MME paper and added a little bling and a line of liquid pearls to finish it off. 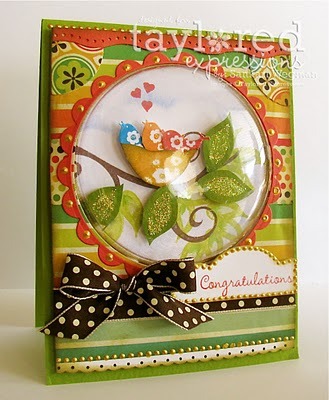 Accessories: embossing folder (TH), bling, ribbon from American crafts, circle nesties, dimensionals and liquid pearls. I loved making this card - it was so nice to keep it simple and such a beautiful sentiment to use - please check out all the gorgeous sentiments from the Beautiful You stamp set! 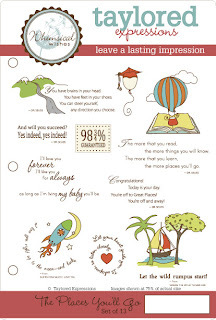 Also while you are there please check out the huge SALE that is happening at Verve Stamps!!! 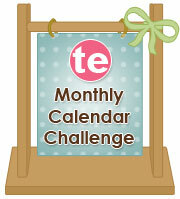 There is also a hidden prize on today's blog hop - so leave a little love as you hop along!! Next on the hop is the sweet and amazingly creative SONY! !